Always be aware of your surroundings. If you feel you are in danger go to a place where there are plenty of people, like a shop, service station or business displaying a yellow Safety House sticker. • Always keep enough money for a taxi or telephone call. • If attacked, shout as loudly as you can. • Nuisance callers will often try to upset you. As soon as you feel that a call is unusual, hang up. If the calls persist, contact your telephone service provider and seek their advice. • Don't let the fear of crime rule your life and stop you from enjoying the things you like doing. A few simple precautions can considerably reduce your risk. • It is best not to carry large sums of money. Try to pay large bills by cheque. 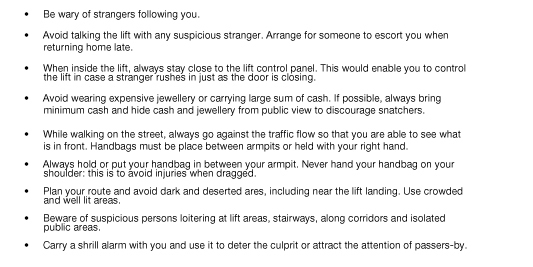 • If you carry a purse or bag, hold it under your arm or in front of you. Never leave it unattended. If you use a wallet, put it inside your jacket or a front pocket instead of your bag, then if your bag does get snatched your wallet will still be safe. Try not to carry more money than you need. • Check the used car you're buying isn't stolen and has no unpaid monies owing on it. Call the Register of Encumbered Vehicles. • If you believe you are in danger: Don't open the door to anyone you don't know and trust. • If someone is at the door and you are alone and feel a bit frightened, pretend there is someone else in the house. If someone wants to use your telephone for an emergency, don't feel rude not to let them in. Offer to make the call for them - if they are a genuine caller they will not mind. 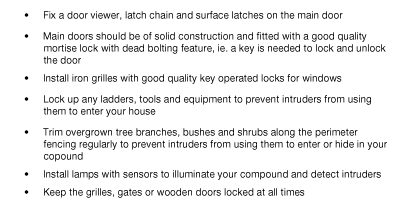 • Be suspicious of people requesting entry to your home to check appliances or equipment. Ask to see their identity card and take time to look at it carefully before letting them in. If you are still unsure, ring their company to check. If in doubt, keep them out. • Make sure your home number can be clearly seen from the street. 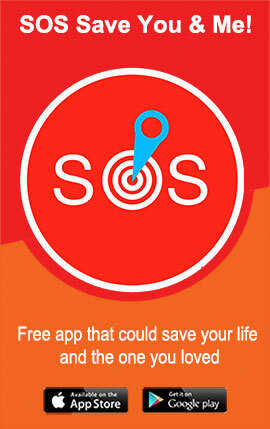 This not only helps in emergencies, it makes it easier for visitors to find your home. • Be discreet if you live alone. It is better not to indicate on house directories or name plates that you are a Ms, Miss, Mrs or Mr. Just use your surname. • Make arrangements to have regular contact with someone you trust. Try setting up a code like three rings on a telephone each morning or simply lifting your blind up at the start of each day so they know you're OK.
• Don’t walk or jog early in the morning or late at night when the streets are deserted. • When out at night, try to have a friend walk with you. • Carry only the money you’ll need on a particular day. • Don’t display your cash or any other inviting targets such as pagers, cell phones, hand-held electronic games, or expensive jewelry and clothing. a lighted house. Don’t be afraid to yell for help. • Try to park in well-lighted areas with good visibility and close to walkways, stores, and people. • Make sure you have your key out as you approach your door. • Always lock your car, even if it’s in your own driveway; never leave your motor running. • Do everything you can to keep a stranger from getting into your car or to keep a stranger from forcing you into his or her car. • If a dating partner has abused you, do not meet him or her alone. Do not let him or her in your home or car when you are alone. • If you are a battered spouse, call the police or sheriff immediately. Assault is a crime, whether committed by a stranger or your spouse or any other family member. If you believe that you and your children are in danger, call a crisis hotline or a health center (the police can also make a referral) and leave immediately. • If someone tries to rob you, give up your property—don’t give up your life. • If you are robbed or assaulted, report the crime to the police. Try to describe the attacker accurately. Your actions can help prevent someone else from becoming a victim. Unfortunately no neighborhood is completely immune to crime. However, there are steps you can take to help keep your neighborhood safe. • Know where your children are. Have your children tell you or ask permission before leaving the house and give them a time to check in or be home. When possible, have them leave a phone number of where they will be. • Help children learn important phone numbers. Have your children practice reciting their home phone number and address, and your work and cell phone numbers. If they have trouble memorizing these, write them down on a card and have them carry it at all times. Tell your children where you will be and the best way to reach you. • Set limits on where your children can go in your neighborhood. Do you want them crossing busy roads? Playing in alleys or abandoned buildings? Are there certain homes in your neighborhood that you don't want your children to go to? • Get to know your children's friends. Meet their parents before letting your children to go to their home and keep a list of their phone numbers. If you can't meet their parents, call and talk to them. Ask what your children might do at their house and if they will be supervised. • Choose a safe house in your neighborhood. Pick a neighbor's house where your children can go if they need help. Point out other places they can go for help, like stores, libraries, and police stations. • Teach children to settle arguments with words, not fists. Role-play talking out problems, walking away from fist fights, and what to do when confronted with bullies. Remind them that taunting and teasing can hurt friends and make enemies. in your neighborhood. Get to know your neighbors and their children so you can look out for one another.